Our Resort Goal was to give our campers an at-home Wi-Fi experience of exceptional quality. A robust, secure & scalable, yet simple solution that enabled a single person to manage & support it from anywhere at any time was crucial. They wanted the resort to be under one network architecture & vision, with advanced enterprise features, including a splash page for guest login. They also wanted the ability to charge for enhanced bandwidth where Guests could have an “at home experience” streaming audio, video, on demand, and other expected wireless experiences. Having a centrally managed system that can be remotely monitored and supported was critical. Having one company to survey, design, architect, install and support 100% 24/7 was the goal. A comprehensive enterprise-class wireless solution was required and Sigmawifi was the answer. To give our campers an at-home Wi-Fi experience of exceptional quality. A single guest network, with advanced enterprise features, including a splash page for guest login. The ability to charge for enhanced bandwidth where Guests could have an “at home experience” streaming audio, video, and other expected wireless experiences. A comprehensive enterprise-class wireless solution was required and Sigmawifi was the answer. Delivered a robust, scalable, performance-optimized Wi-Fi Solution with incredible coverage! Accomplished an implementation that has exceeded our guests’ expectations! Virtual Controller based solution with cloud management, reporting and analytics! Best practice services and guest amenities now offered through Wi-Fi! Enhanced wireless technology a state of the art end user experience! Providing ongoing proactive device management, monitoring, and 24/7 support! We came to Sigmawifi at the end of our 2015 season to upgrade our Wi-Fi. They came in quite a bit underprice from other companies. We are in rural Iowa with 68 acres. As most campgrounds, we have a lot of trees with some open space. Where Sigma really shined is, up to this point we had been limited to phone lines at 6GB or point to point at 18GB. 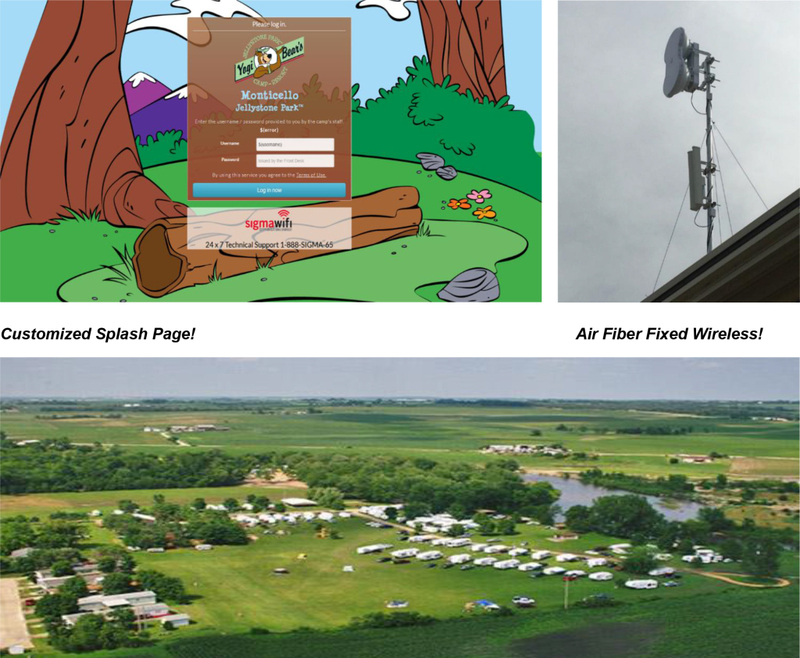 Sigmawifi designed and installed a fixed wireless solution pulling 100GB from a data center 3 miles from my campground! We required the installation to be done prior to Memorial Day weekend and they were able to meet the deadline. The first weekend, we had 185 active users on at one time which I thought was great, until I heard July’s numbers. On July 2nd, 3rd and 4th, we peaked at 223/241/218 connected devices accordingly. On July 22nd and 23rd, we were at 227 and 237. Pretty impressive totals! We are set up with constant monitoring and have had no problems this season!! The system they installed is totally upgradeable and I am told can handle whatever my campers throw at it. So far so good! Nestled beside the Maquoketa River in Monticello, between Dubuque and Cedar Rapids, Yogi Bear’s Jellystone ParkTM at Monticello is a family friendly camping destination that has been a family tradition since 1974, and widely recognized as one of the premier campgrounds in Iowa.